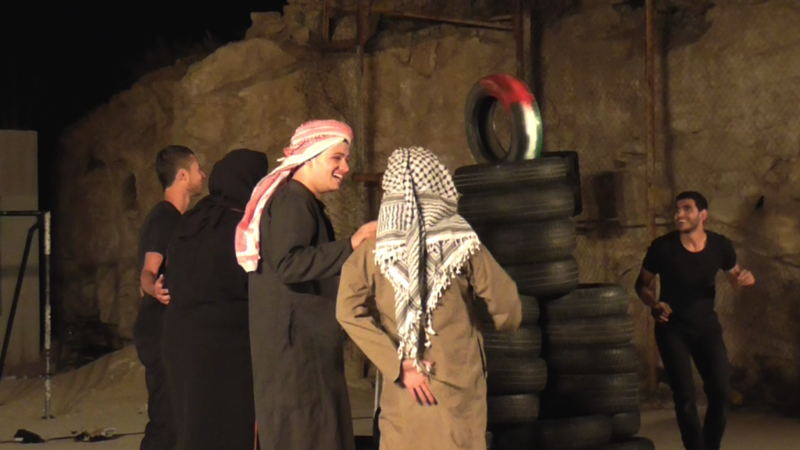 The Freedom Theater permormed their new production “Atuwani” in the village of At Tuwani on October 29th and 30th and toured the West Bank. The play follows extensive research and interviews with community members, with a special focus on the women who play a central role in At Tuwani’s struggle. 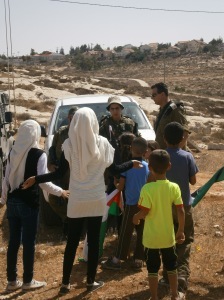 Playing the role of Al Mufaqarah inhabitants and South Hebron Hills children during the summer camp. 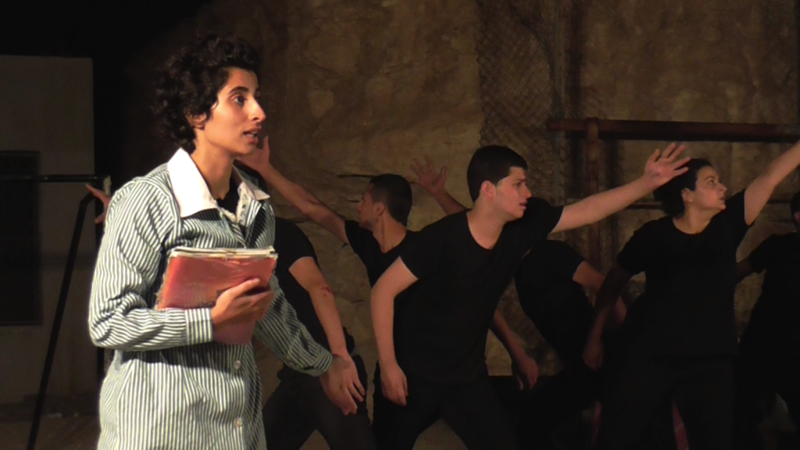 Il Freedom Theatre ha portato il suo nuovo spettacolo “Atuwani” nel villaggio di At Tuwani il 29 e 30 di Ottobre e in tour nella West Bank. Lo spettacolo segue ricerche ed interviste con i membri della comunità, particolare concentrazione è sulle donne che giocano un ruolo fondamentale nella lotta di At Tuwani. P/R: IDF demolishes in the Bedouin villages of Um ad Daraj and Um Al Kher, South Hebron Hills. The Israeli forces violently assaulted the inhabitants of Um Al Kher village. At-Tuwani – On October 29 Israeli forces demolished a total of four structures in the Beduin village of Um ad Daraj and a traditional oven in Um Al Kher beduin village. Men and women from Um Al Kher were assaulted by Israeli soldiers and Border Police officers, while they were peacefully trying to prevent the demolition. At 7:40 am Israeli military forces broke into Um ad Daraj with two bulldozers. The IDF demolished a toilet, a shelter for the sheep, a cave used as home and a tinplated house, in which were living eight people. 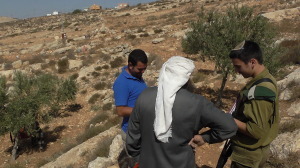 At 9:00 am the Israeli forces arrived at Um Al Kher village and declared a “close military area” for internationals and Israeli civilians, subsequently pushed the international volunteers present to monitor the human rights violations far from the village, threatening them to be arrested. 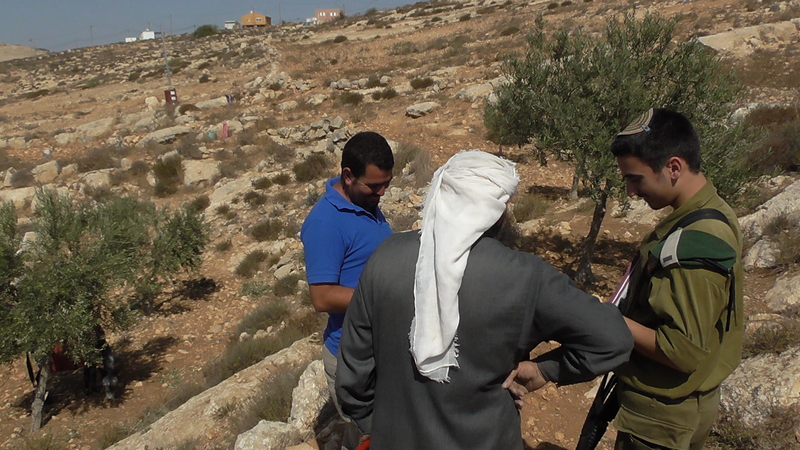 After that a bulldozer, escorted by Israeli army and Border Police went inside the village damaging a fence and an olive tree. Palestinians inhabitants of Um Al Kher gathered in front of the traditional oven and tried to peacefully prevent the demolition. Israeli soldiers and Border Police officers attacked them, pushing violently away the women and shoving down a boy. After the aggressions the bulldozer destroyed the oven. The traditional oven was already demolished, without any demolition order issued for it, on October 27 together with other six structures. On October 28, the oven was rebuilt by the South Hebron Hills Popular Committee together with the inhabitants of Um al Kher. 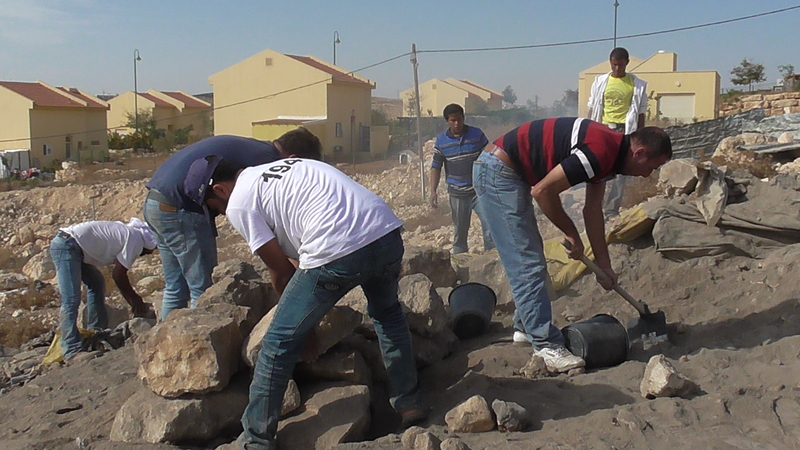 (For more informations about the demolitions on October 27 you can see: www.tuwaniresiste.operazionecolomba.it ). The traditional oven was rebuilt for the second time by Palestinians before the end of the morning. 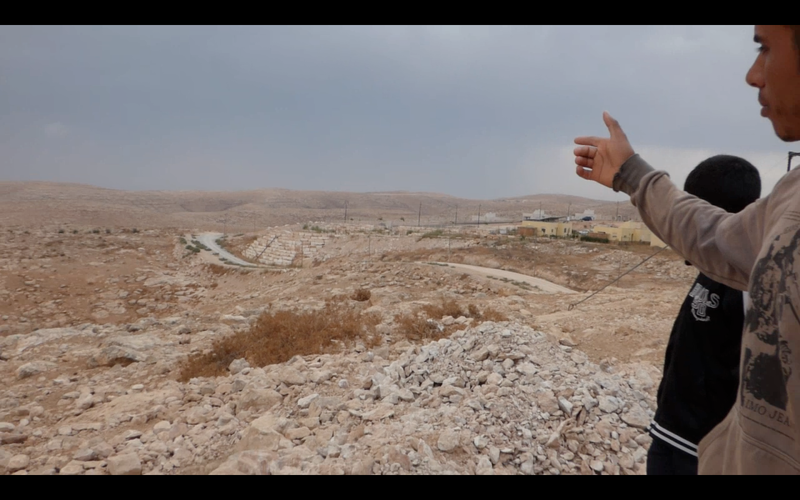 Palestinians from the South Hebron Hills keep struggling in a nonviolent way to claim justice and defend human rights. L’esercito israeliano demolisce nei villaggi beduini di Um ad Daraj e Um Al Kher, nelle colline a sud di Hebron. L’esercito israeliano ha aggredito gli abitanti del villaggio di Um Al Kher. At-Tuwani – Il 29 ottobre l’esercito israeliano ha demolito un totale di quattro strutture nel villaggio beduino di Um ad Daraj e un forno tradizionale nel villaggio beduino di Um Al Kher. Uomini e donne di Um Al Kher sono stati aggrediti mentre tentavano di interporsi pacificamente alla demolizione. Alle 7:40 le forze militari israeliane sono entrate ad Um ad Daraj con due bulldozer. L’esercito israeliano ha demolito un bagno, un recinto per le pecore, una grotta usata come casa e una casa di lamiera dove vivevano 8 persone. Alle 9 le forze israeliane sono arrivate ad Um Al Kher e hanno dichiarato “area militare chiusa” agli internazionali e civili israeliani, di conseguenza hanno cacciato i volontari internazionali presenti sul posto per monitorare le violazioni di diritti umani, minacciandoli di arresto. A quel punto i bulldozer, scortati dall’esercito israeliano e polizia di frontiera sono entrati nel villaggio danneggiando una recinzione ed un albero d’ulivo. Gli abitanti palestinesi di Um Al Kher si sono riuniti di fronte al forno tradizionale per tentare di interporsi pacificamente alla demolizione. Soldati e poliziotti israeliani li hanno attaccati, spingendo violentemente le donne e buttando a terra un ragazzo. Dopo l’aggressione il bulldozer ha demolito il forno. I palestinesi delle colline a sud di Hebron continuano a lottare in modo nonviolento per reclamare giustizia e per la difesa dei diritti umani. After the demolitions inflicted yesterday by the IDF, today the South Hebron Hills Popular Committee gathered with the inhabitants of the bedouin village of Um Al Kher to rebuild the structures. The traditional oven has totally been rebuilt. The Israeli police tried to stop the works saying that the Israeli settlers of Karmel will soon complain again against the smoke. Nevertheless, the Palestinian men, women and children completed the construction and will continue the works in the next days. Dopo le demolizioni inflitte ieri dalle forze dell’ordine israeliane, oggi il Comitato Popolare delle Colline a Sud di Hebron si è riunito con gli abitanti del villaggio beduino di Um Al Kher per ricostruire le strutture colpite. Il forno tradizionale è stato completamente ricostruito. La polizia israeliana ha tentato di fermare i lavori dicendo che i coloni israeliani di Karmel presto si lamenteranno nuovamente per il fumo prodotto. Nonstante questo, gli uomini, donne e bambini palestinesi hanno completato la ricostruzione e continueranno i lavori nei prossimi giorni. IDF demolishes in the Bedouin village of Um Al Kher, South Hebron Hills. An Israeli activist and an international volunteer arrested. 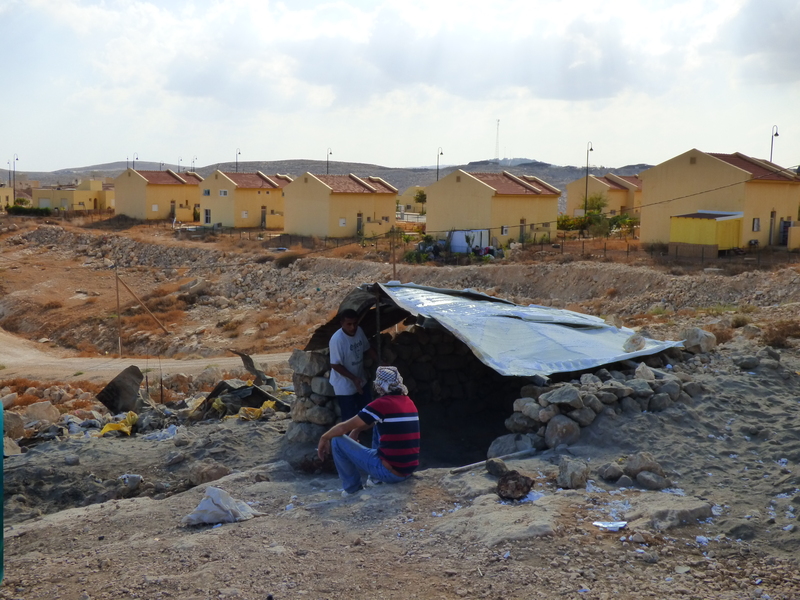 At-Tuwani – On October 27 Israeli forces demolished a total of seven structures in the Bedouin village of Um al Kher. The structures demolished are: three houses made of concrete, a caravan donated by the United Nations (United Nations Human Rights Response Fund with the support of Ireland, Norway, Spain, Sweden, Switzerland and United Kingdom) to be used as a home, a tinplated house, a tinplated kitchen, a traditional oven. The structures belonged to five families, for a total of thirty people affected. An Israeli activist and an international volunteer were brought and detained in Kiryat Arba Israeli police station. At 9:20 am a convoy of eleven Israeli army vehicles and two bulldozers reached the Bedouin village of Umm Al Kheer. At 9:34 the bulldozers started the demolitions while Israeli soldiers, Border policemen and DCO officers kept Internationals and Israeli activists away from the village, declaring “closed military area”. Around 10 am the Israeli police arrested an international volunteer and an Israeli activist with the accuse of remaining inside the area. Both were released during the same day. Um Al Kher is a Bedouin village in area C, under Israeli civil and military administration. It’s located very close to the Israeli settlement of Karmel, established during the beginning of the ’80s and expanded in the recent years, especially in 2013. 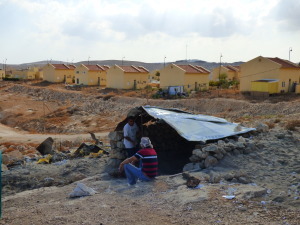 The village routinely experiences harassment from Israeli settlers and army. 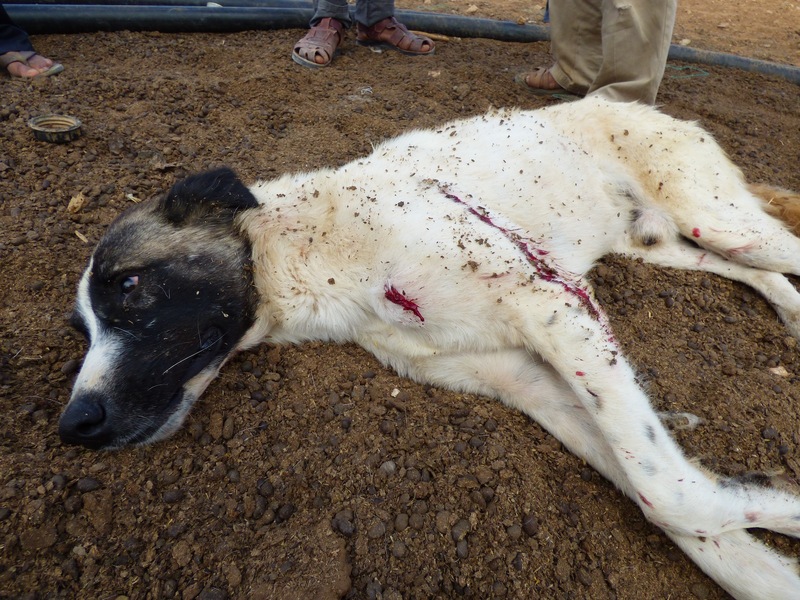 Palestinians from the South Hebron Hills keep struggling in a nonviolent way to claim justice and defend human rights. The South Hebron Hills Popular Committee together with international volunteers and Israeli activists will soon gather to re-build the demolished structures in Um Al Kher. L’esercito israeliano demolisce nel villaggio beduino di Um Al Kher, nelle colline a sud di Hebron. Attivista israeliano e volontario internazionale sono stati arrestati. Alle 9:20 del mattino un convoglio di undici veicoli militari e due bulldozer sono arrivati nel villaggio beduino di Um Al Kher. Alle 9:34 i bulldozer hanno iniziato le demolizioni mentre i soldati israeliani, gli agenti della Border Police e i funzionari della DCO hanno trattenuto a distanza gli internazionali e gli attivisti israeliani, dichiarando l’area “militare chiusa”. Intorno alle 10:00 la polizia israeliana ha arrestato un volontario internazionale e un attivista israeliano con l’accusa di essere all’interno dell’area. Entrambi sono stati rilasciati nel corso della giornata. Um Al Kher è un villaggio beduino nato nel 1948, situato nelle colline a sud di Hebron in area C, sotto controllo civile e militare israeliano. Trovandosi a pochi metri dall’insediamento israeliano di Karmel, sorto negli anni ’80, il villaggio è soggetto a vessazioni ed a maltrattamenti da parte dei coloni dell’insediamento e dall’esercito israeliano. I palestinesi delle colline a sud di Hebron continuano a lottare in modo nonviolento per reclamare giustizia e per la difesa dei diritti umani. 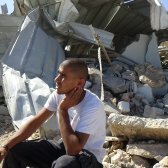 Il Comitato Popolare delle Colline a Sud di Hebron con volontari internazionali e attivisti israeliani si riuniranno a breve per ricostruire le strutture demolite ad Um Al Kher. 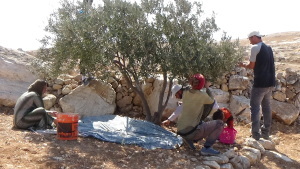 Palestinians are harvesting olives in the South Hebron Hills, despite different harassment from Israeli forces and settlers. Schools remained closed in the days dedicated to the harvest and the oil production to allow families to work together. 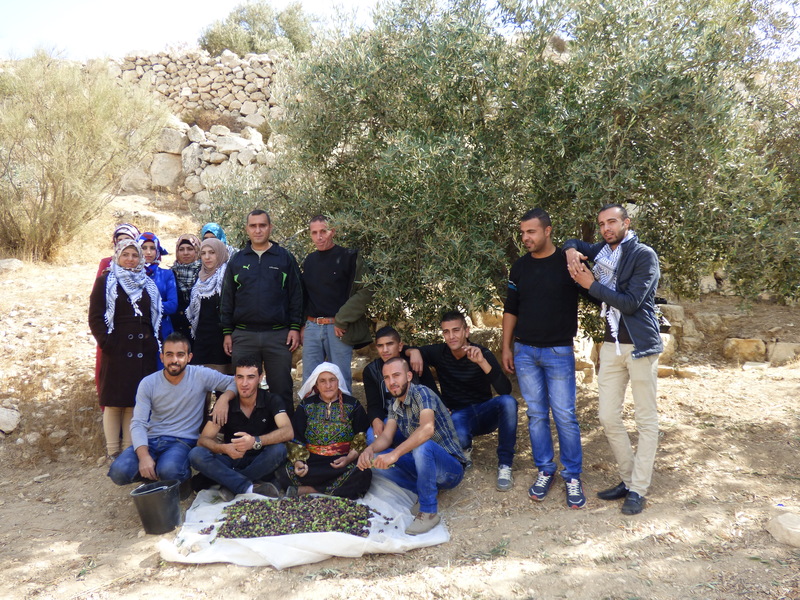 On October 17, Palestinian families went harvesting their olive trees near Avigayil illegal outpost. Israeli forces tried to prevent them, showing maps stating that some trees were inside the security area of the outpost, where Palestinians are not allowed to enter. Thanks to B’tselem operators and International volunteers Palestinians could finish harvesting. In Humra valley, in the Palestinian village of At Tuwani, the days of the harvest were almost all quiet: on October 17 some settlers came from Havat Ma’on Israeli illegal outpost, riding a horse and quad bikes, to verbally harass Palestinians. On October 19 the South Hebron Hills Popular Committee organized a nonviolent action: some Palestinian students from Yatta University went in At Tuwani village to pick olives and water the young trees they planted on the previous spring. On the land right in front of Suseiya settlement’s entry, Palestinians owners from Susiya had to wait the permission from the DCO in order to pick olives. On October 26 Israeli forces monitored the harvest for the all time. 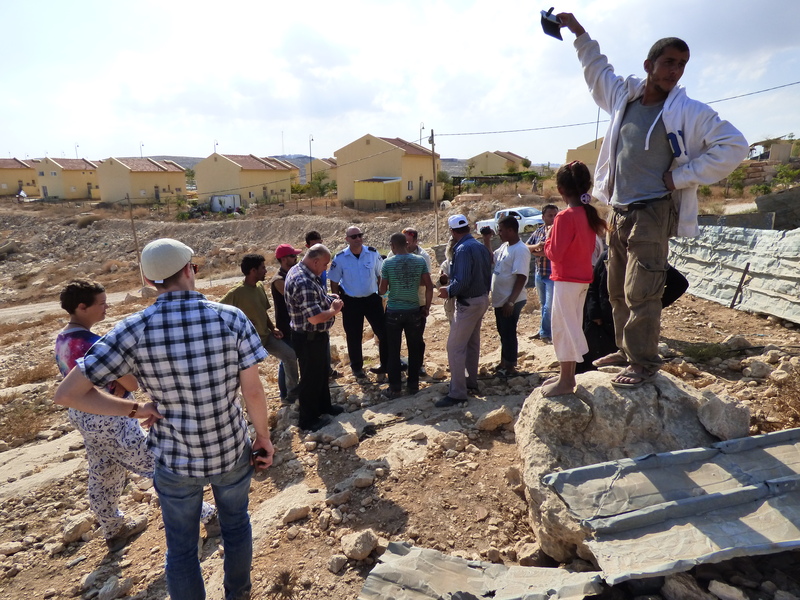 Students from Yatta University together with members of the South Hebron Hills Popular Commitee, in At Tuwani village. Palestinin family picking olives in Humra valley, At Tuwani village. 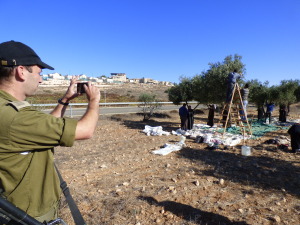 DCO officers tries to prevent Palestinians from picking olives near Avigayil Israeli illegal outpost. Nelle colline a sud di Hebron si sta svolgendo la raccolta delle olive. I Palestinesi dell’area stanno completando la raccolta nonostante alcuni momenti di tensione. Le scuole sono rimaste chiuse nelle giornate dedicate alla raccolta ed alla successiva produzione dell’olio per permettere alle famiglie di lavorare assieme. Il 17 ottobre famiglie palestinesi si sono recate per la raccolta sulla loro terra nei pressi dell’avamposto illegale di Avigayil. Le forze dell’ordine israeliane hanno tentato di fermarli, mostrando mappe secondo le quali alcuni degli ulivi di loro proprietà sono nell’area di sicurezza dell’avamposto, dove ai palestinesi è vietato l’accesso. Grazie alla presenza di operatori di B’tselem e volontari internazionali i palestinesi hanno potuto ultimare la raccolta. Nella valle di Humra, nel il villaggio palestinese di At Tuwani, le giornate di raccolta delle olive sono state quasi sempre tranquille: il 17 ottobre alcuni coloni dell’avamposto illegale di Havat Ma’on sono usciti a cavallo e su dei quod per aggredire verbalmente i palestinesi. Il 19 ottobre il Comitato Popolare delle Colline a Sud di Hebron ha organizzato un’azione nonviolenta in cui alcuni universitari della città palestinese di Yatta si sono recati nel villaggio di At Tuwani per raccogliere olive dagli alberi adulti, e portare acqua ai giovani ulivi piantati la primavera scorsa. Nelle terre che si trovano immediatamente davanti all’ingresso della colonia di Suseiya, palestinesi del villaggio di Susiya hanno dovuto aspettare il permesso delle forze israeliane della DCO per poter raccogliere. Il 26 ottobre le forze dell’ordine israeliane hanno monitorato il lavoro per tutto il tempo. At Tuwani – Saturday October 18, two nonviolent actions organized by the South Hebron Hills Popular Committee took place in the South Hebron Hills area, claiming the right of Palestinians to access their own lands. The first in the area of Umm Al Arayes, located near the Israeli outpost of Mitzpe Yair; the second in the area of the Palestinian village of Susiya, located close to the Israeli settlement of Suseya. Both Palestinian-owned lands are under threat of dispossession because of the illegal settlements’ expansion. 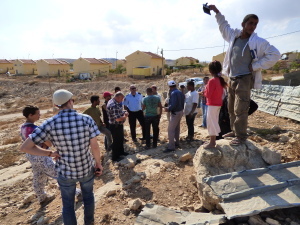 In Umm Al Arayes, at 9 a.m. Palestinian owners of the land accompanied by Israeli activists and international volunteers gathered to claim the right to access their land. The Israeli forces already present on the place immediately stopped the participants and declared the area as “military closed”, preventing anyone to access it. Israeli police arrested two Palestinians and four Israeli activists with the charge to have been in the forbidden area. Last Saturday, during a similar nonviolent action, Israeli activists were brutally attacked by settlers from Mitzpe Yair (video of the incident: http://goo.gl/qFE3fX). Since 2001 the Palestinians have faced restricted access to these lands. In the past weeks, in response to a legal petition filed by Palestinians’ lawyer, the Israeli Court forced the settlers to dismantle several greenhouses they illegally built on that same land. In Susiya, at 10 a.m. Palestinian owners, accompanied by Israeli activists and international volunteers, marched on their land to make pressure against the settlement’s illegal expansion. For the third saturday in a row Palestinians dismantled the tent built illegally by the settlers where they used to gather every afternoon preventing the owners to graze on the land and use the well. At 11:10 a.m. Israeli army declared the area as “military closed” and started to violently push away Palestinians and activists, as they were peacefully resisting the evacuation of the area while Israeli settlers were standing there. In both nonviolent actions Israeli forces prevented the Palestinian owners to access their lands allowing Israeli settlers to grab those lands and illegally build structures on them. Nevertheless, Palestinians from the South Hebron Hills keep struggling in a nonviolent way to claim justice and to stop the ongoing appropriation of Palestinian land. At Tuwani – Sabato 18 ottobre, il Comitato Popolare delle Colline a Sud di Hebron ha organizzato due azioni nonviolente per rivendicare il diritto dei palestinesi ad accedere alle proprie terre. La prima nell’area di Umm Al Arayes, vicino l’avamposto israeliano di Mitzpe Yair; la seconda nell’area del villaggio di Susiya adiacente alla colonia israeliana di Suseya. Entrambe le terre di proprietà palestinese sono sotto minaccia di esproprio a causa dall’espansione illegale delle colonie. Ad Umm Al Arayes, alle 9 del mattino, i proprietari palestinesi, insieme ad attivisti israeliani e volontari internazionali, si sono riuniti per reclamare il diritto di accesso alla loro terra. L’esercito israeliano, già presente sul posto, ha immediatamente fermato i partecipanti dichiarando “area militare chiusa”, impedendo a chiunque di accedere al terreno. La polizia israeliana ha arrestato due palestinesi e quattro attivisti israeliani con l’accusa di essere all’interno dell’area interdetta. Sabato scorso, durante un’azione nonviolenta analoga, gli attivisti israeliani sono stati brutalmente attaccati dai coloni di Mitzpe Yair (video dell’incidente: http://goo.gl/qFE3fX). Dal 2001 i palestinesi hanno affrontato le limitazioni nell’accesso a questi terreni. Nelle scorse settimane, in risposta ad una petizione presentata dall’avvocato dei palestinesi, la corte israeliana ha obbligato i coloni a smantellare diverse serre che avevano costruito illegalmente sugli stessi terreni. A Susiya, alle 10 del mattino i proprietari palestinesi, accompagnati degli attivisti israeliani e da volontari internazionali, hanno marciato sulla loro terra per fare pressione contro l’espansione illegale della colonia. Per il terzo sabato di fila, i palestinesi hanno smantellato la tenda costruita illegalmente dai coloni ed utilizzata ogni pomeriggio impedendo ai proprietari del terreno di pascolare nell’area ed usare il pozzo. Alle 11:10 l’esercito israeliano ha dichiarato “area militare chiusa” ed ha iniziato a scacciare con violenza i palestinesi ed gli attivisti che stavano resistendo pacificamente allo sgombero, mentre alcuni coloni israeliani sono rimasti nell’area in questione. Durante le due azioni, le forze israeliane hanno impedito ai proprietari palestinesi di accedere alla loro terra, permettendo invece ai coloni israeliani di appropriarsene e costruirci illegalmente strutture. Ciononostante i palestinesi delle colline a sud di Hebron continuano a lottare in modo nonviolento per reclamare giustizia e fermare la continua confisca illegale di terra palestinese.